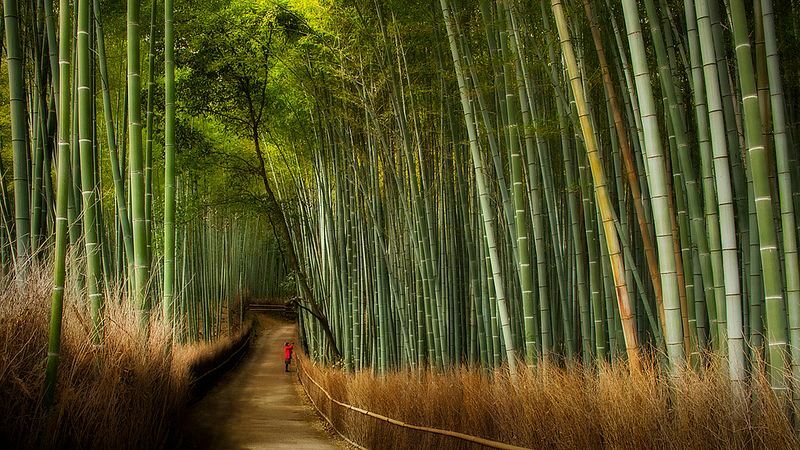 Forest is located in Arashiyama, a district on the west outskirts of Kyoto, Japan. Sagano Bamboo Forest is one of the most amazing natural sites in Japan. One of the most interesting facts about Sagano Bamboo Forest is the sound which the wind makes while it blows amongst the bamboo. Amazingly enough, this sound has been voted on as one of the ”one hundred must-be-preserved sounds of Japan” by the Japanese government. The walking paths that cut through the bamboo groves make for a nice walk or bicycle ride. The groves are particularly attractive when there is a light wind and the tall bamboo stalks sway gently back and forth. The bamboo has been used to manufacture various products, such as baskets, cups, boxes and mats at local workshops for centuries.